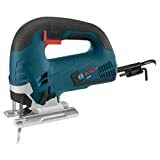 Well, if you are looking for a very handy jigsaw, you have come to the right place, because today we will be reviewing the Bosch JS365, a powerful 6.5 Amp motor device made specifically for professional construction works and DIY enthusiasts. Well, if you are into construction or you like spending the weekend in the shed/workshop, this is a must-have tool for you. This powerful device makes cutting through any wood very precise and fast that you can finish the job in no time while making straight-line cuts. Bosch is a professional manufacturing company which has been in business for years, making some of the best world power tools. With about 15 years of experience, this trusted company has been producing top-notch power tools solely for use by the construction industry. However, this jigsaw is one of the company’s most bought power tools. It is a great tool for its users, providing a very easy to handle operation, and it is suitable for armature users too, providing all types of cuts on different types of materials like wood, ceramic and even metals. Although this device can cut through anything, some users actually complained about the straightness of the cutting and the blades, but this can be resolved by following the company’s instructions. Well, this device was actually designed just like its predecessor, the Bosch JS365. This device comes with a top handle which is very easy to use. This ensures a very firm grip on the device while working and it is also ergonomically designed, to make sure you don’t get tired when using it, or your hands won’t experience any fatigue. It can also help to cut at any angle very easily. This device comes with a T-shank blade which is best known and guaranteed for the best accuracy while cutting through any materials and its stability, providing less vibration while in use. This power-tool, also comes with a tool-less blade change, making it easy to change the blade with only one hand while ensuring you do not touch the hot blades for your safety. For the Bosch JS365, this comes with a 6.5 Amp motor more powerful than its predecessor. As you all know, the standard Amp for a jigsaw is 5 amps which usually cut through any material like butter, so having a 6.5 amp makes this device more powerful than average. This makes this device suitable for very large projects over a long period of time. This model also comes with a trigger sensitive variable speed. Most jigsaws come with different buttons to change its speed, but this particular power tool comes with only one pressure sensitive trigger, meaning the harder you press, the more speed it gives off. This might be confusing for you at first, but as time goes on, you can subconsciously learn how to control the speed by allowing your intuition to do the driving. This device is made of a hard plastic cover with a foot plate made up of entirely heavy steel. It also comes with a dust blower, to ensure both your cutting part is clear and to help prevent particles from entering the device. This device was surely built with durability on its mind because it is designed in such a way it can be used for a long period of time. Q: Can this device adjust to make bevel cuts? A: Yes, it can. This device comes with a Die-cast aluminum foot plate with steel insert and an on-board bevel wrench, making it possible to adjust it to make bevel cuts. Q: what is the warranty like? A: The Bosch company gives a full one year warranty and a 30 day fully refundable return. Looking at what the public says about this device, you can actually go on to say that this is definitely a device to get for your project. A lot of people were really happy about this product with solid ratings over a lot of website. This makes it safe so say that overall, buyers really liked the product. Most users loved this product because it was made specifically for armatures. Others loved it because of its fine design and its durability. One user said he has been using his device for years now and he still plans on making use of it in the following years to come. Others recommended the powerful motor this model comes with saying it is way ahead of the standard power required by a jigsaw. With all the positive reviews, they were still people who weren’t satisfied. Most people either complained about the foot plate not being straight enough and the cuts being crooked. However, the general conclusion is that this model is a very powerful tool to get for your workshop as it can cut through virtually any material. With all the positive reviews, you can tell this is a tool to trust already. Coming to the end of this review, we now know that the Bosch JS365 is a very great tool to have, despite its flaws, you can be safe while using it by following the company’s guidance. It can cut through anything, no matter the size of the materials, but the bigger the material, the less likely the straightness of the outcome. This is why it is more suitable for personal DIY projects as to it involves less thick materials, but as for professional contractors? It is okay too, but they may consider going for a more reliable and powerful tool.